I joined the Model United NationsClub in middle school. I read voraciously about the Rus-sians, about Marxism-Leninism, about the Soviet space program, and aboutcollectivized agriculture. I read everything that I could get my hands on,hoping to understand the Soviet worldview so that I could more accurately represent them and convincingly argue their position on the key worldissues of the day: the Middle East, Northern Ireland, and nuclear prolifera-tion among others. I played Poland and Romania on a couple of ad hoc committees and then was ﬁnally assigned to be Bulgaria on the Security Council. In 1985 Bulgaria was a relatively small country about the size of Delaware with a population of about nine million. In early June of 1990 I found myself in Turkey after having traveledoverland from Egypt through Jordan, Iraq, and Syria. The Bulgarians would have none of me; they only entered a thirty-hour transit visa so that I could take the train to either Yugoslavia or Romania. I ﬂipped a coin and chose Yugoslavia. It was a mixture of intellectual curiosity and infatuation that would lead me back to Bulgaria in January and March of 1998.During those ﬁrst two visits I was shocked to realize that the hopes and dreams of 1990 had not been realized. Although most people were still glad that communism was gone and agreed that the totalitarian past was best put behind them, the promises of democracy had not been realized. Many Bulgarians I met had started to question the transition process. Where there had been security and order, there was now chaos and unchecked criminal violence. Where there had been universal health care, the best doctors now worked in fee-only clinics for the new rich. Where there had been free university education,there were now private colleges. Where there had been a decent amount of gender equality, there was now outright discrimination against women. In Bulgaria, he said, they had torn down the old house (communism)before the new one (capitalism) was ready. Everyone was now forced to liveon the street. It was clear tome in 1998 that there were people suffering in Bulgaria, that democratzia was not all that it was cracked up to be. From that wondrous summer in1990 emerged a dark reality. People who had worked hard and built success-ful careers under the old system were cheated out of their well-deserved retirement. Men and women in the middle of their lives had to drastically change course just to stay aﬂoat; they had to learn new skills, new lan-guages, and an entirely new way of thinking. A whole generation of young people lost the futures for which they had been preparing themselves.Entire academic disciplines disappeared overnight; what do you do with a PhD in Marxist economics or dialectical materialism in a capitalist society?In short, daily life had been turned on its head. No one knew what the rules were anymore. My students seemed funda-mentally unable to comprehend the sheer magnitude of that change. 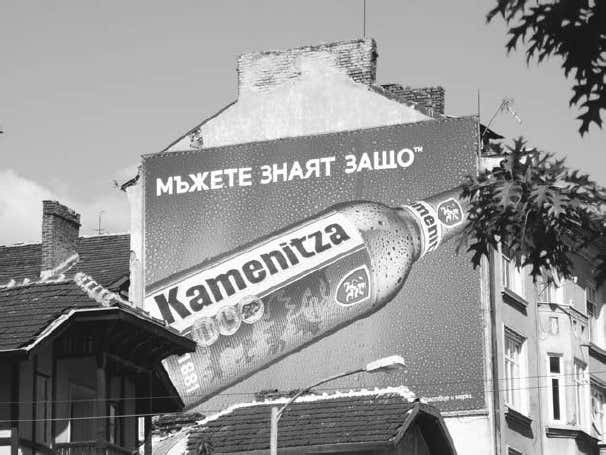 An ad for a Bulgarian beer that simply says ‘‘Men know why.’’ When asked, most Bulgarians don’t actually know why. The Slovenian philosopherSlavojˇZiˇzek really put his ﬁnger on something when he said that it is fareasier for young people today to imagine total planetary environmental catastrophe than it is for them to imagine any signiﬁcant changes in thepolitical and economic system that will precipitate this catastrophe. Bulgaria is a country about which most Westerners have few preconceived notions. Unlike Russia or Poland or the former Yugoslavia, Bulgaria has seldom been in the international spotlight,and few people know much about this relatively small country tucked into the most southeastern corner of Europe. Even with all of my background in current events, I did not know what to expect of Bulgaria when I ﬁrstboarded that train in Istanbul back in June of 1990. Irish, German, Italian, Slavic, Scandinavian, and eastern European Jewish immigrants were just as isolated in their ethnic enclaves in the nineteenth and early twentieth centuries as today’s immigrants are in theirs. New York’s Kleindeutschland was so German, bragged one of its immigrant residents in the 1850s, that one could hardly tell it apart from Stuttgart. Half a century later, adult Italian immigrants rarely learned much English. “I didn’t need it,” one New Yorker explained. “Everywhere I lived, or worked, or fooled around there were only Italians…. I had to learn some Sicilian, though.” When pundits complain that today’s immigrants don’t assimilate like those from the past, they are harking back to a golden era of assimilation that never actually existed.